Nintendo president Satoru Iwata has insisted that his company ruled out motion sensing camera after trials suggested that the accelerometers the Wii uses were more effective. 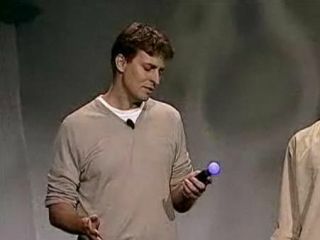 Nintendo's hardware announcements at E3 were limited to a finger pulse-detector – which caused some bemusement at the exhibition – and further demonstration of the impressive Wii MotionPlus technology, which increases the sensitivity of the Wiimote and is arriving soon. Sony and Microsoft, on the other hand, showed prototypes of motion sensor tech that is not yet on the verge of being released; but Iwata told the Financial Times that using cameras to track movement was something Nintendo had experimented with but chosen not to implement. Iwata also suggested that, until pricing and arrival dates are confirmed, it would be difficult to make a judgement on the likelihood of success. "Until they say when they're releasing it, how much it costs and what software it comes with, we won't know whether that is the route we should have taken. However . . . I think they couldn't choose to release exactly the same thing," said Mr Iwata. "Companies whose people said that motion-sensing wouldn't work are now proposing motion sensors," he added.